Verla Lee (Brooks) Boatright was born in Russellville, Oklahoma, October 27, 1919. 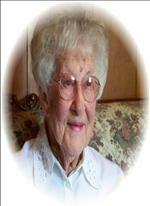 She went to her permanent rest with the Lord on March 18, 2010 in Henryetta at the age of 90 years and 4 months. Verla or (Jo) as she was affectionately called and known by many was born a healthy baby girl to Thurman Lee and Velia (Wright) Brooks. She was raised in Quinton, Oklahoma and graduated with the Class of 1937. She excelled in mathematics and vocal music winning regional awards in both. Verla came to Henryetta in 1937, worked as a waitress at Tommy’s Café and married Harold Boatright November 13, 1942 in Wichita Falls, Texas. For 45 years she was employed as a professional bookkeeper, first 30 years for Boerstler Brothers Wholesale Grocery and finally 15 years as Deputy Treasurer for Okmulgee County. She and Harold were married 57 ½ years at the time of his death in 2000. An avid fisher and outdoors woman she and Harold traveled the lakes and rivers in Oklahomaa, Colorado and Wyoming from the late 1940’s through the early 1990’s. She loved the mountains of the West. Verla had a passion for “old stuff” and loved history. Holidays were always a favorite time of the year and decorating was a hobby. She was generous to a fault and loved giving gifts, especially at Christmas. Her family, especially her grandchildren and great-grandchildren were the special joys in her life. She enjoyed the various stray cats that came by for a free meal over the years and never disappointed any of them. Verla was a life member of the VFW Post 539 Ladies Auxiliary. She volunteered each Friday evening for several years with the Bingo games fundraisers at the VFW Post Home. She and Harold loved to dance and spent many an enjoyable evening covering the dance floor. She was preceded in death by her parents, husband Harold, a brother Lyle Brooks and a granddaughter, Rejeana. She is survived by son Marvin and daughter-in-law Karen of Henryetta, a Granddaughter Kalli Dodge and husband Steve of Henryetta, Great-Grandson Tanner Dodge and Great-Granddaughter Abigail Faith Dodge of Henryetta, niece Carolyn (Wagoner) Hyatt and husband Leo of Yukon, niece Shawna Patro and husband Jim and nephew Lex Brooks and wife Ann of Tulsa and sister-in-law Madeline Pricilla Brooks of Tulsa, special friend Robin Churchill, other relatives and a host of friends. Pallbearers will be Don Polston, Phil Agee, Jerry Vail, Sam Kelch, Danny Tourett, & Bobby Hardrigdge. Funeral Services are scheduled for 2:00 p.m., Monday, March 22, 2010 at First United Methodist Church with Rev. Dale Durnell, officiating. Interment will follow in Westlawn Cemetery under direction of Integrity Funeral Service.